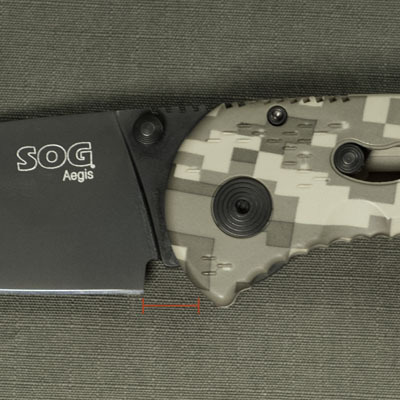 Having never owned an assisted open knife, I recently decided to purchased a SOG Aegis in digital camouflage. In Greek, Aegis means “shield” or “protection”; an apt name for an every-day-carry (EDC) knife that may be used in emergency situation. The Aegis uses the S.A.T. (SOG Assisted Technology) system for opening the blade. Give it a little push (with the safety off), and the knife does the rest. I found the best way to achieve a quick, safe opening is to hold the knife firmly at the bottom and push the blade stud with my middle finger. This allowed me to open the knife with one hand quickly, easily and safely. Switching to the Aegis was hard at first. I’ve been using the Buck Vantage Avid for several years, and using an assisted open knife was a major change. Overall, the Aegis is a good knife with a very sharp blade. The AUS 8 steel holds an edge well and the blade length is about perfect. The carrying clip does exactly what it should, and includes a feature I find especially nice: the clip extends past the end of the knife. 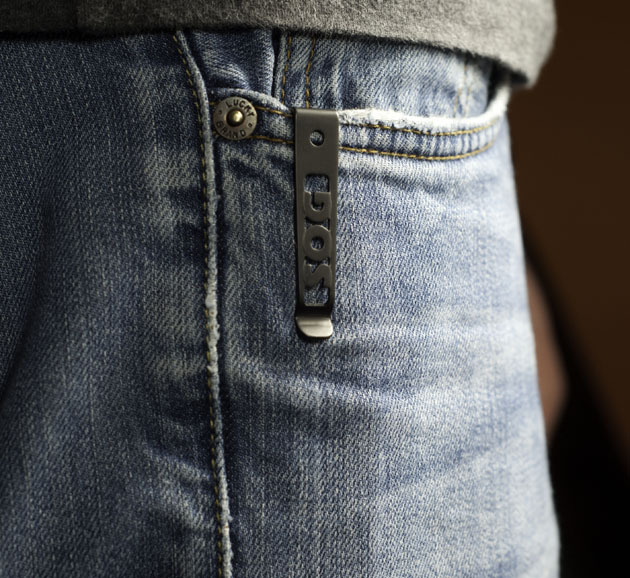 While carrying the knife, this deep clip puts the knife below the lip of the pocket, thus making it more concealed. Now, some of that concealment is ruined by the large “SOG” letters on the clip, but it is a nice touch nonetheless. Build quality is another strong suit, as it is for most, more expensive SOG knives. The verdict is still out on if it is worth the almost $30 premium over the Ontario Rat we reviewed earlier. I was less than impressed with the “SOG” rubber inserts. They seemed more like plastic to me, and didn’t add much grip. Although, the DigiGrip Zytel plastic grip and the other bumps and notches on the knife provided good grip. My biggest frustration with the Aegis was the gap between the end of the blade and the handle. I constantly find small objects such as thin rope or string getting caught in this area (see image). The SOG Aegis Tanto doesn’t seem to have this problem, but it is an entirely different style of blade. Even though it has a couple of shortcomings, the benefits of the solid build quality, lightness, and easiness of carrying are undeniable. The more I use and carry the Aegis, the more I like it. The SOG Aegis should provide many years of great use. I’m a fan of SOG’s “assisted technology” for easy opening, so by default I really love this knife. I’ve had mine for a couple of years now and it is tough as nails.